Jason Theaker - Portfolio. Information about individual print - PayPal purchasing information and location. It’s now 8am and I have been awake for 4 hours! The first hour I tried to get back to sleep, but the bed in our holiday cottage is just that little bit too small and for some reason being on the opposite side of it to my usual, kind of unsettled me more than I would have anticipated. My mind kept sparking into action, even though I tried very hard to think of nothing. In fairness I did try to meditate, something I usually do effectively rendering me unconscious, but for this time it really didn’t have the desired result! Anyway, slowly it dawned on me that I was going to have to get out of bed and occupied myself with one of several options. I think the internal mental postulations as to which activity I was to do cemented my fate and got me out of trying to ignore the obvious. Anyway as you can see I decided to leave the book I brought with me unopened and after a couple of strong coffee’s and some toast I began sifting the images I had made the previous day on a workshop I ran with a great bunch of clients. We had had an interesting day. The weather was up and down like a yoyo, but as I reassured them, this was a good thing for capturing drama. I’m never quite sure if clients believe me when I say that. It often feels like it’s an attempt to justify the inclement conditions and attempt to jolly them up. I can see it on their faces! But in true honesty, it is! Part of the reason I love all conditions is that it really does help you feel alive! Yes it’s not pleasant, driving freezing hale, snow, rain and biting wind does leave you questioning your positioning on an empty beach, whilst many are sheltering inside with hot chocolate and carrot cake! But in total honest I mean it! I genuinely enjoy the feeling of being there, feeling the wind on my face, the Icey waters in my walking boots and the sand in-between my toes! It make the pint of Theakston’s with the pub meal a few hours on, taste even more wonderful, because I really did earned it! 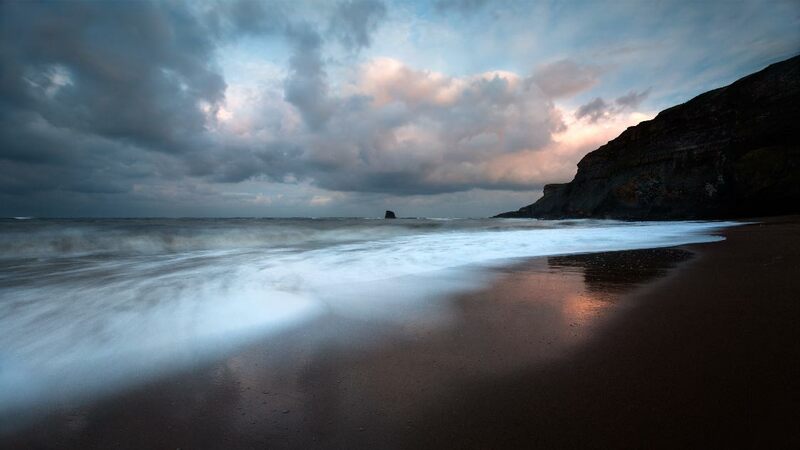 Anyway this image is from Saltswick Bay just a few miles from Whitby. It’s a popular spot with photographers and is often very busy, especially at low tide where many are often huddled around the ship wreck waiting for the sunset in mid-summer! That said I have been here many times and I never fail to enjoy the solitude. This evening I have several clients with me and I was helping them enjoy it too! One nearly got cut off at the West end of the beach as he was enjoying the flat shelf too much as the tide raced in, but it all adds to the fun if you ask me! Anyway this evening the light was very nice, there was a ten minute illumination where the beach seemed to light up. The sand here is a wonderful browny red colour and as the sky caught the sunset colours it reflected in the sand and surf and for a few munities felt magical. Anyway this is my personal favourit of the evenig, it’s not the most vibrant one but it reflects the atmosphere for me down there perfectly.